The European Code of Good Conduct for Microcredit Provision is an instrument for ensuring quality standards in the European microfinance sector. It is a voluntary instrument, developed in response to the need for a unifying set of expectations and standards for the sector for the benefit of practitioners, customers, funders, investors, regulators and partner organisations. The purpose of the update is to finetune the current clauses, where appropriate, to better reflect market realities and the diversity of the institutions in the European microfinance sector. In addition, the existing Code self-assessment tool and Code methodology document need to be revised accordingly. 2) contributing to spreading the use of the code as a best practice for microfinance operations at European and world-wide levels. Following a competitive tendering process, the University of Salford has been selected to conduct this process. This will include drafting interim changes to Code based on feedback from sector, prepare content for and facilitate five stakeholder workshops, test interim changes with a representative number of practitioners and drawing on results of testing and consultation to update Code in close liaison with the Commission and key stakeholders. In preparation for the consultation, the MFC set up a working group consisting of practitioners, the Code evaluators and the MFC. This group produced a series of recommendations for amending the Code which serves as one of the sources for further work. The University of Salford will prepare and facilitate five stakeholder workshops held in Brussels and hosted by the European Commission (see table below). Eleven MFIs were invited to the workshops to ensure representation of different providers in terms of country, size, maturity and experience with the Code. Eight stakeholders, including EMN, MFC, EU institutions, banks, investors and experts, were also invited.The participants will review and discuss the changes proposed in the amended interim Code. They will reach consensus on recommendations for the changes to the Code, which may include accepting, rejecting or amending changes to the Code. 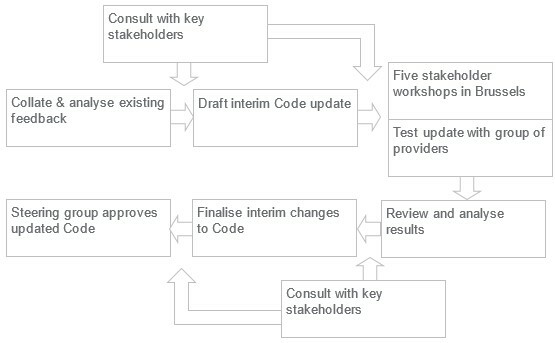 The table below shows the key milestones and dates for the Code revision process. The consultation and testing process is scheduled to last until May 2019. The drafting of the final Code will take place between June and August 2019. The date for the Code Steering Group meeting to approve the amended Code has yet to be fixed. The Code Steering Group will decide on the timetable for the implementation of the revised Code.